In a world rebuilding after global mechanized war, chaos and ethnic tensions rule. City-states like Blightcross prosper under dictatorships built upon oil production. Refugees flock to the city-state to find work in the massive oil refineries. The black blood of Blightcross is replacing vihs-draaf, the magic of the Ehzeri people, but magic hasn’t entirely disappeared…yet. For fugitive soldier and thief Capra Jorassian, Blightcross is an opportunity to earn enough money for her freedom. Stealing an enchanted painting from the dictator’s collection is nothing new. But the simple heist gets complicated quickly when Capra’s childhood friend shows up, bent on bringing her back for court martial. Then her eccentric employer, the creator of the painting, is kidnapped, throwing Capra into a struggle for the survival of Blightcross, with only her enemies as allies. 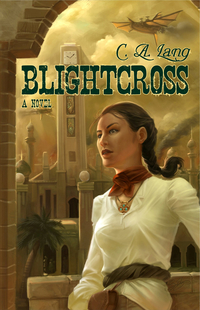 Blightcross breaks the boundaries of steampunk, using fantasy to explore the world of post-colonialism and the greed of oil dependent cultures. C. A. Lang is a product of Nelson, British Columbia, and it shows. While meandering through the natural health industry in everything from editing to personal training to sales, he frittered away nearly a decade writing widely, all the while nurturing an unhealthy affair with no less than six guitars. Growing up around Victorian architecture likely had something to do with his appreciation of steampunk, although we're not quite sure why he felt the need to ditch the steam engines and go all internal-combustion on the genre. He has settled in Kelowna, B.C., where sometimes he can be found abusing a gigantic jazz guitar in public, hanging around certain wineries, and running obscene distances just to atone for it all.